If anyone showed up for Sunday morning racing, no one mentioned it to me, so moving on. Thursday night featured yet another perfect summer evening, with sunny skies, warm temps, flat water and a light southeasterly. Seven boats came out to play and were sent on a clockwise course that started with a long downwind leg to the nun behind Grays Rock, a beat back to the can off the middle of the harbor and then a short, port-tack close reach to the finish. The start was tricky, forcing people to choose between the pin, which was closer to M1 but also a position that was potentially blanketed by boats starting to weather, or further up the line, which had potentially clearer air but more ground to cover. The level of difficulty at the pin was upped by how the moored boats were hanging around it, leaving room for just one boat to squeeze between the pin itself and the stern of the moored power boat to weather of it. So a high-risk gambit, assuming you can call anything in beer can racing high risk. Anyway, rolling the dice and squeezing through that hole was Walter Colsman sailing solo, who shot off the line to a lead he would never relinquish. Right behind him was John Casler sailing with Connie Blake, but Walter’s lighter crew weight on that long downwind run helped him pull out. On the beat (after the starboard rounding), Walter tacked onto port and rode that all the way into Peaches Point before tacking back onto starboard, seemingly uninterested in doing a lot of solo tacking, and John followed him. The rest of us took a more conservative path, attempting to play the shifts up to M2, reeling him in a little, but ultimately not enough to pass. So, a tip of the cap to Walter with his well-deserved solo bullet. Taking 2nd was Kim & Christopher Pandapas, and finishing 3rd was Team Casler. Honorable mentions go to Team Martini, who finished 4th and Team Sheldon/Sousa in 5th. Congratulations to all. Also another beautiful day out on the MRA line, as 17 boats showed up to wrap-up of Series 2 and get in a final warm-up before Race Week. Making his very welcome 2018 MRA debut was Joe Fava, sailing with Beanie Eisner. As many of you know, Joe’s longtime sailing partner, dating back to college, is the very pregnant Elise Nash, who is due in early September so taking the season off. Anyway, great to have Joe and Beanie on the starting line. Conditions included plenty of sun, relatively flat water and an up & down easterly in the range of 5-10 knots that clocked right as the day wore on. To say it clocked, I suppose, suggests a gradual shift, but in this case, it was more of an instantaneous lurch. About halfway into the second sequence of the first race (Viper’s start), we got hit with a 40+ degree righty, inclining PRO Susie Schneider to fire off two and turn her attention to setting up a course change for the J70s, who were about halfway up the 1st beat. The J70s that went right, by the way, found themselves reaching into the mark close to a quarter leg in front of those who went left, some of whom were forced to do that long, port-tack walk of shame. Anyway, the timing worked out so that it made more sense to finish the Js before starting the Vipers, Rhodes and Townies, so that’s what Susie did. We started our first race a little after 1:30, and ultimately got in two – or actually 1½ as they finished us at the leeward mark on the second race – more on that in a minute. The racing was challenging. When the breeze finally settled in, it was fickle, both in terms of up and down pressure and 15 degree oscillations. So it was one of those up and down days where one minute you felt like you’re crossing everyone and then bam, they’re all crossing you. Some days it’s all about the pressure, and others it’s more about the shifts. This day was about both. Anyway, as to the shortened second race, as we all converged from both sides on the leeward mark, the RC patrol boat positioned itself to our right of the pin (so looking like the usual finish), put up an S-flag and started blowing a horn. At that precise moment many members of our fleet lost their minds. As we all (should) know, an S-flag means shortening the course. It always goes up adjacent to an existing mark of the course so that when honoring that mark, boats finish. You can only shorten a course at a mark of the course, and no matter what, the mark needs to be honored. Somehow however, for some reason, many of us got confused, some finishing properly, some between the leeward mark and the signal boat, and some between the signal boat and the green finish pin. In the end, just four boats were scored DNF, but that totally understates our collective confusion. So why did we all lose our minds? Not sure, but probably a combination of things. Boats were converging from both sides, so there was a lot of port-starboards and blanketing going on. The change felt a little short notice, which isn’t a big deal, but with all of the convergence and port-starboard positioning going on, we may not have had time to fully process the S-flag. Perhaps also contributing was time of day, as shortening at 3:30 after just one race was a little unexpected. None of that matters though. The S-flag mean what it means, and we should all know that by now. So congratulations to Team Cooke/Kaznoski, who won the day with a 3-1 for 4 points. Bet they were happy to see that S-flag. Taking 2nd just one point back was Team Taylor, who put up a 1-4 for 5 points, and finishing 3rd was Team Heffernan/Harsono with a 4-3 for 7 points. Honorable mentions go to Team Lane/Heffernan who took 4th on a tiebreaker with a 2-9 for 11 points, and Team Frisch/Hourihan in 5th with a 5-6, also for 11 points. Congratulations to all. That wacky finish brings to an abrupt conclusion MRA Series 2. Taking 1st was Team Taylor with 32 points. Their race 1 bullet showed grace under pressure, picking the pocket of Team Pandapas who led going into the final day. Finishing 2nd was Team Pandapas with 37 points, and taking 3rd was Steve Uhl with 41 points. Honorable mentions go to Team Frisch Hourihan in 4th with 56 points, and Team Felton in 5th with 59 points. Congratulations to all. So, in Cup competition, here is how things stack up going into Race Week, which given the number of boats, races and hence total points, always has the potential to turn this on its head. The top 10 are listed below. Week 10 racing will include the big enchilada, Marblehead Race Week, which will run from Thursday through Sunday. There will be no Thursday night racing this week. Don’t forget that the Race Week party will be Thursday evening at the home of Jennifer & Steve Uhl on Front Street. As usual, it’s potluck but Dave Reynolds will supply the fleet bar. If you haven’t done so already, please RSVP on your evite. Race Week Registration –If you’re not registered yet, what on earth are you waiting for? Click these links to register and download the NOR. Club Socials – The second of our two club post-race porch get togethers was on Saturday at the CYC. Thanks to CYC for providing the cash bar and supporting one-design sailing by opening their doors to non-club members, while at the same providing a catalyst to get us all together after racing, which is not easy in this 4-crane town. A tip of the cap to Debbie Noble, who was the only non-CYC member to make the trek. Sportsmanship Update – We heard of no fouls or spins this week, so our spin competition remains knotted at 1 between Team Rubin, Team Cormier/Dalton, Team Berliner and Dave Nelson. Remember, if you spin, send it in. 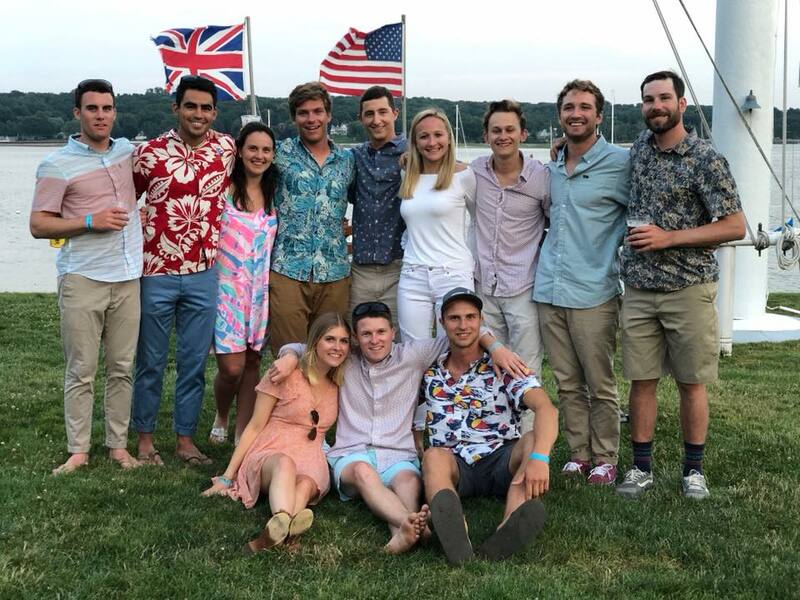 CYC Team Racers win at Seawanhaka – Congratulations to Team CYC, who won the 2018 Seawanhaka Corinthian Yacht Club Young Guns Team Race in Oyster Bay, NY. CYC entered day 2 seeded second and progressed through to the final to beat Yale Corinthian Yacht Club for the win. Yacht clubs participating in the event included Yale Corinthian, Dartmouth Corinthian, Annapolis, Larchmont, Noroton, New York, hosts Seawanhaka Corinthian and our own CYC. We heard from Martha Martini with an inquiry about last Thursday’s Twilight finishes. “Hi Kim! Great newsletter as always. I appreciate the time and effort that you put in as scribe for the Fleet. It can’t be easy. Quick question: Are you certain of the finishing sequence for Thursday’s race? So far as I know, we beat Jocelyn that race.” Well, we looked into it, and learned that, in fact, Team Martini had beaten Team Cook, reversing the finishes we reported last week. This from Jocelyn, “As best as I recall, it was a close and exciting race but in the end, Martha pulled ahead gaining ground as we both approached the finish.” So there you have it. Team Martini finished 5th with Team Cook right behind in 6th, and series scoring has been adjusted to reflect that. We saw this post by Nat Taylor about Steve Uhl’s quick swim at the finish of last week’s final MRA race. “Deploy the swim ladder! Steve Uhl went literally ‘all out’ this week, as he used every ounce of available body weight to carve his boat down to cross the finish line perpendicular and steal the bullet! Asked, before the results were posted if he won, he responded, “I don’t know I was underwater!” Luckily it was all laughs and was OK.” Hmm, maybe that swim ladder thing isn’t such bad idea. And now that I think of it, isn’t there some rule somewhere about having to finish with the same number of crew you started with? Well, no matter. We got a couple of emails on the trimming article, one sent to me and the other a cc that I eavesdropped on, but both from crews with multiple Outstanding Crew Awards on their sailing resumes. The first from Christina Pandapas, who always pushing to up our game, wrote, “This is really interesting — I’d like to work on this — synching jib and main trim. Let’s make this part of our communication Saturday.” And don’t think for a second that we didn’t! The other was a half-page email from Elise Nash, the gist of which was this, “This is a great article – one of the key points I took away from was that it is as much about communication as it is about trimming. How things are communicated within the boat can make all the difference in those critical moments. Joe and I have been sailing together for so long at this point that we can practically read each other’s minds and have our different modes (speed mode, point mode etc.) pretty much set – in team racing those switches happen a lot faster so the communication btw boatmates becomes even more critical.” Maybe we should get Elise and Christina to put on a R19 crewing clinic next spring.